Iron Cage Table Lamp If you appreciate finely crafted pieces, you'll fall in love with this iron cage table lamp's attention to detail. From its intricate base to its iron cage body, this table lamp is truly a testament to quality craftsmanship. Plus, it offers multiple brightness levels with its 3-way lighting. If you appreciate finely crafted pieces, you'll fall in love with this iron cage table lamp's attention to detail. From its intricate base to its iron cage body, this table lamp is truly a testament to quality craftsmanship. Plus, it offers multiple brightness levels with its 3-way lighting. Shade Dimensions: Top W: 12" x Bottom W: 18" x H: 12"
Love the look but. . . I love the look of this lamp but I almost immediately had a problem with a finial. The part of the finial that screws onto the harp detached from the decorative cover. This means the decorative cover has no practical use and must be removed to tighten the finial. Bought 2 of these back in 2011...still looking great and going strong!!! Love them! Purchased two of these for our sunroom. The lamp design and color combination matches our other furniture perfectly. The lamps are well made. This lamp is very nice. Looks very elegant. I use it in my family room. Beautiful lamp. Very stylish. Purchased two to match my new Corina bedroom set. This lamp is so pretty I bought a 2nd one plus a 2nd nightstand perfect to finish my matching bedroom set i,m very pleased! This is a gorgeous, well-made lamp that looks wonderful in my tv room. 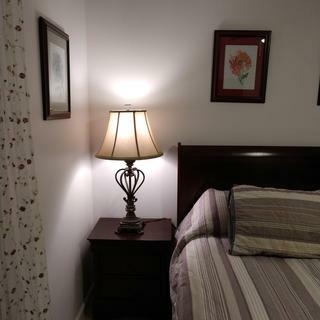 This lamp matches the new bedroom design perfectly. We like the fact that it is a 3-way lamp so there is more light in the room. Beautifully made, solid base. I like that it takes a 3-way bulb. Would have given 5 stars except the wire was very twisted and took awhile to get it straightened and through all the parts. Love these lamps but after only a few months the three way had broke. Ray our has great customer service....they had 2brand new lamps shipped to my local store. Please what is the voltage rating for this product? BEST ANSWER: The lamp requires one 3-way bulb up to 100W.